APPROPRIATELY suited and booted, a tenacious local woman is putting her best foot forward for her own personal pilgrimage of remembrance. As part of the national programme commemorating the centenary of the First World War, Mary Baker is retracing the footsteps of her grandfather who, like so many, was killed in action in France. Her Walk of Remembrance is in memory of the lives lost and those left behind whose were drastically changed. She is raising money for DropBy, her small charity working to end isolation for the elderly, and the Army Benevolent Fund. Private James Baker had been called to Knaphill’s Inkerman Barracks to join his regiment before they went off to the Great War in 1914. 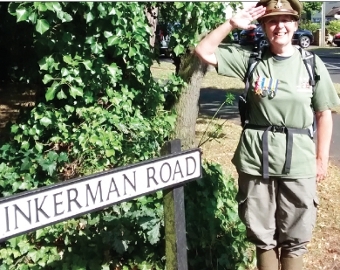 Mary said: “My plan was to retrace his journey from Inkerman Barracks to Southampton on August 21 – exactly 100 years to the day he made the start of his momentous and historic journey. “My grandfather was recalled to the ranks of the 2nd Battalion Royal Sussex Regiment, in which he was a Reservist, on August 6, 1914. After making the same trip to the site of the former Inkerman Barracks, Mary walked along the Basingstoke Canal path to Woking Station before taking a train to Southampton docks. Sadly, like thousands of others, Private Baker was killed in action, in the Battle of Troyon on September 14. Mary added: “My father was six when his dad went off to war. As he departed, he told him: ‘If anything happens to me, William, remember you are the man of the house’. Mary will travel to Bernay on September 5. She said: “I will walk the approximately 100 miles from Bernay to Troyon, retracing as accurately as I can the march of the battalion, as detailed in the Regimental War Diary. Befittingly, she plans to finish her epic quest in Troyon on the anniversary of her grandfather’s death on September 14. Mary said: “I will lay a wreath at the War Graves Cemetery of unknown soldiers and hold a service of commemoration with members of my family on the battlefield itself. TO DONATE send an email to maryb@dropby.co.uk or go online to www.dropby.co.uk for more details.